He is in dire need of new jokes. 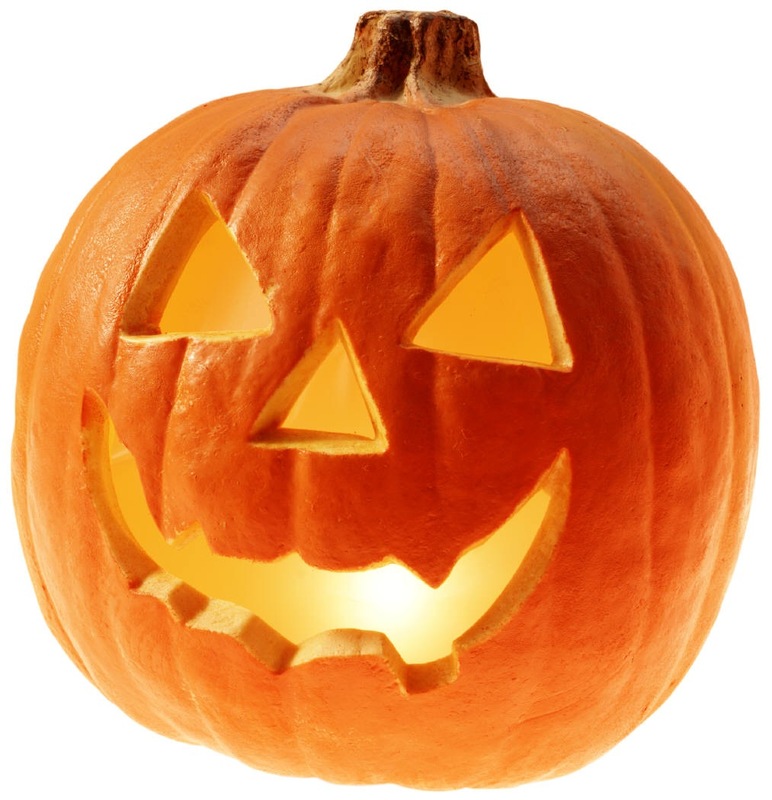 If you have a Halloween-themed joke for him please send it in to me by email or using the Contact page. Every year I make a few tweaks and enhancements to the Halloween display. This year I am adding fog to the mix. The question is whether I will fabricate a fog chiller to get it to hang low on the ground. I would like to figure out how to get my stepper motors for the spiders to reliably return to a consistent starting position. Isn't that supposed to be the advantage of stepper motors? They are supposed to always move an exact amount. So if I tell them to spin forward 10 revolutions and then back 10 revolutions, they should end up right where they started. Well they don't. Maybe my linkages are slipping, or maybe I've overstressed the steppers to the point where they don't work perfectly. I've thought of adding an optical sensor tied to a piece of black tape on the PVC pipe I rotate to raise and lower the spiders to make things really closed-loop, but that seems like overkill. I'm going to work on the linkages as the first suspect. I do have an idea for a new prop that will make a ghost or monster light up and whizz through the sky back and forth, but I'm having trouble figuring out how to mount the rope and pulley system it will need. I kinda want to attach it to a telephone pole across the street but fear that might be overly ambitious. I haven't brewed in a long time. Not since Memorial Day weekend. A good chunk of that batch never made it back from Dave's bachelor party weekend at White Pass. All of my kegs went dry about a month ago and I've been living the nightmare of having to purchase commercial beer for home consumption. I even fell for the sucker's deal of 6.99 a 6 pack for Full Sale Pale Ale...it was not a pleasant thing to drink, supporting my theory that beer goes on sale when the brewery made a mistake. It pains me to pay $20 for a half case of good commercial ale when I can make 5 gallons for about the same expense. 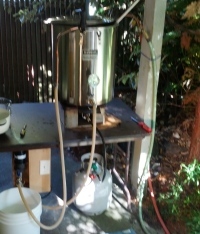 So it is time to put the brewhouse in order and crank out a batch of my old reliable house American Pale Ale (APA). I'm going to turn and burn this one in rapid fashion so I can free up the carboys for a lager. Perhaps a reprise of "May the Schwarz Be With You" Schwarzbier. 19 lb 2 row. Might be Maris Otter. 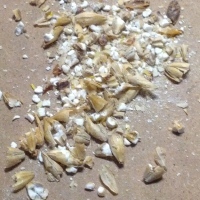 "Gluten Free Greg" gave me a bunch of grain when he swore off beer (again) and wasn't sure exactly what it was. 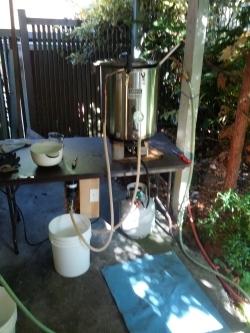 Most often this one goes pretty quickly on tap, straight from the primary into the keg. I've drank it 10 days after brewing and it was a bit cloudy, but in the next 3 weeks went to very clear as it settled in the keg. I take a pretty relaxed approach to this beer. 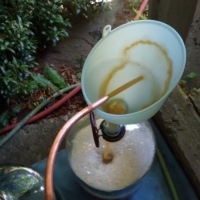 I save my fussiness for lagers where I bother with things like yeast starters, stir plates, whirlpooling, a salted ice water chiller reservoir, and a long secondary fermentation stage. I batch sparge, and for the pale ale I am transitioning to a method I call "fill er up" where I maximize my mash container capacity. 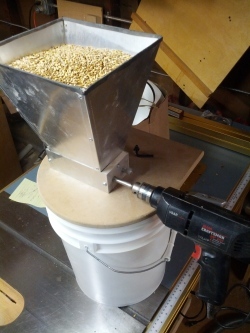 I know I can do about 23 lb of grain with 10 gallons of water for the mash. Then I do a second batch sparge with 7 gallons and end up with about 14 gallons to start my boil. Now in the past I've tried to boil that down until I got to a good 10 gallon batch size...maybe down to 11 gallons or so, allowing for trub loss. That was taking a lot of boil time however. With the fill er up approach I just roll with what happens with a straight 60 minute boil. So whatever I end up with, that's my batch. Last time it was 13.25 gallons, necessitating a third carboy for primary fermentation, but so be it. I take a similar lackadaisical approach to the OG: whatever it is, it is. I am happy with anything between 1.048 and 1.058. I treat my water since the Seattle tap water is pretty bare bones in terms of mineral content. To 12 gallons of tap water I added 22g gypsum, 2g table salt, and 11g epsom salt to hit a Chico-like water profile that will make the most of the hops. I also throw a tablespoon of 5.2 into the mash for good measure, and use whirlfloc at flameout. I take care with my process but am no purist. As the saying goes, "reinheitsgebot is a four letter word." For ales, it is just dry yeast for me. The modern dry yeasts can go head to head with liquid for quality. The only reason I see to go through the hassle and expense of liquid yeast is for something special where there is no viable dry yeast, like a Bohemian Pilsner. I love the Safale T-58 for a bit of very light Belgian flavor, and otherwise use the S-04 english ale yeast. I used S-05 before but thought it was just too clean. I try to get things setup the night before, sweeping out my little covered back corner that I convert to the brewhouse, setting up the table, getting the propane and burner in place, setting up the pump, and filling the kettle with an initial 12 gallons and treating it, and getting all of my grain ground. Then in the morning it is a quick heatup to about 165 and I get my mash on and away we go. 8:50 Mash started, lid on the cooler. Had a bit of a challenge with the mash temp. Overshot to 157, then added too much cold water to bring it down, topped it off with more hot water but only got it up to 150 rather than my target of 152 - 154. This means I will get a little less body and a little more starch conversion to sugar. In theory it will make for a cleaner, higher alcohol brew. My preference would be for a little more malty body to come through, but oh well. I tossed an extra gallon+ on top of the batch sparge for good measure (more is better, right?) and ended up with 16.25 gallons. The pre-boil OG is 1.039. Beersmith says that after an hour of boil with a 9% evap rate and 4% cooling shrinkage, I should end up with a final volume of 14.2 gallons. Adjusting the gravity for this final volume yields a predicted OG of 1.045. Beersmith estimates my OG should be 1.047 for 14.2g with my grain bill if I hit my usual target brewhouse efficiency of 80%. 1.045 is a little on the weak side of things...this will be a quaffer not a sipper I guess. With an OG of 1.045 and an estimated FG of 1.011 we get 4.43% ABV. Style guidelines for an APA call for 4.5% - 6.0% so we are at the session end of an APA. I often end up at 6% with this beer, but that is after a big boil down to a true 10 - 11 gallon batch, not this quick and dirty 60 minute boil and pitch route. 10:45 start of the boil. 16 - 17 gallons is a lot of wort for my little 20 gallon BoilerMaker. I am concerned about boilovers so take the time to skim the foam and run it at a simmer rather than a full boil. 11:45 One whirlfloc tablet. I like a clear and pretty beer you can hold up in the sunlight and admire. Repeat the mantra "Reinheitsgebot is a four letter word." 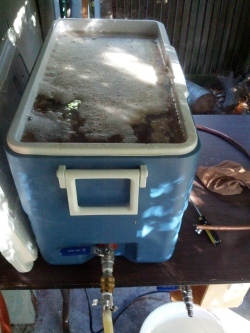 11:50 flameout, final 3 0z Cascade, chill on, took a sample for OG measurement and started the chiller. 13:00 chilled to 68F, pitched the yeast, moved the carboys to the main floor bathroom where they should see 70 - 72F for a good warm fermentation. Usually I would primary in the basement at closer to 65F, but with this being a bit on the weak side I'll take whatever fruitiness or other flavors a warmer fermentation might impart. OG is 1.045 with 14 gallons in the fermenter, which means my brewhouse efficiency is 75% and I should hit around 4.4% ABV when all is said and done. Am I happy with this? No. I plan for 80% efficiency and have hit it pretty reliably in the past, so something is off with my technique. Probably the mash temperature. But hey, I've got 14 gallons of beer in the fermenters, which is nothing to sneeze at! Then comes the cleanup...about 90 minutes of solid toting and scrubbing. This is the drudgework part of brewing. It always reminds me of a Basic Brewing Radio podcast I listened to once where they interviewed a homebrewer who had recently gone pro. He said the first thing they ask in their job interviews is how the candidate feels about cleaning, because cleaning is a major part of the job. The results with this batch make me wonder how strong of a beer I can do with the simple "fill er up mash" approach. I'm not sure I will be that satisfied with a brew that clocks in at under 5% ABV. This time I had 23 pounds of grain...what if I had 26 pounds? The most I have ever mashed in my cooler is 24 pounds. Obviously I would have a thicker mash and less wort sparged with the additional 3 pounds of grain. I think I will try it next time I do an ale. It will be interesting to see how the tradeoff works: more convertible starch combined with smaller sparges will be a double whammy gravity booster. But no way will it be 14 gallons unless I add a third sparge to the mix. What will I get...maybe 12 gallons of 6% ABV? I've decided to call this batch "GFG Pale Ale" to honor the role of its benefactor, "Gluten-Free Greg" who provided the 2 row barley. Or maybe it was Maris Otter. Who knows. In about 10 days I'll be drinking it, so hit me up for a pint around the 20th. I just finished a small home improvement project: putting an 8 foot shelf and closet rod in Cathy's closet. It was a big upgrade for her clothing storage efficacy. Now I am in the cleanup phase, putting all of the shop back into as much order as it ever gets...which isn't saying much. I am getting tired of just stacking clamps on the ground in the corner, and thinking of putting a proper clamp storage rack on the wall. 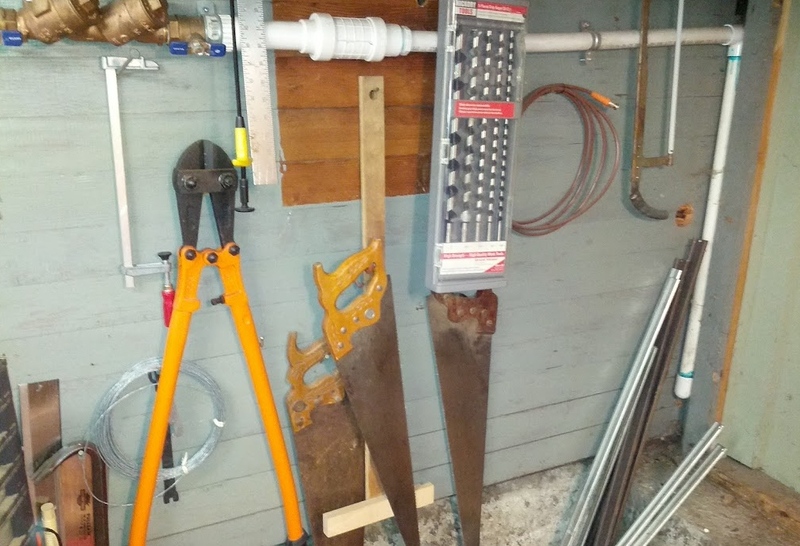 That would displace the hand saws, auger bits, and overkill bolt cutters though....hmmm. I am sure I can figure out a place for those rarely-used items. Let's get things started with some serious reflection on the weighty topic of the recent plastic bag ban in the city of Seattle. For readers from far afield, the citizens of Seattle recently voted to ban plastic bags, and furthermore to charge a $0.05 per bag fee on paper bags. It is supposed to help the environment or something I guess. I'm not too keen on laws that micromanage individual choices, and was always a diligent recyler of the plastic bags from our beloved Ballard Market and other local stores. In the spirit of opening the kimono, I now reveal the fact that I voted against the bag ban. But I am somewhat ambivalent about it. It does sadden me to hear about beached whales with large numbers of plastic bags in their stomachs. It took me a few months to get in the swing of things and remember to bring my reusable bags. At first I just went with the paper bags for a nickel a piece, but after a few too many sidelong glances that seemed to be re-evaluating my worth as a person, I got with the program and started bringing my own bags. Plus also, I really got sick of the baggers "doing me a favor" by single bagging my groceries and failing to put things like milk or beer in the bag. Listen baggers, I'm not going to be thanking you for saving me the double-bag extra nickel when the bottom falls out of the bag or the handle rips off and all of my groceries explode onto my front steps. Reusable bags need to be managed. Take them in, empty them, and then you need to remember to put them back in your car. My biggest pet peeve, and something I suspect few voters anticipated, is the space these things take up in your cart. I always use the mini-carts, and now a good 1/3 of my cart capacity has to be devoted to bags. Baggers have to deal with a greater variety of bags, which must make then less efficient. I predict slower checkout times overall. Update! Here's a good one. If you go to the self-checkout stations at Fred Meyer and hit the "No Bags" button, it will automatically put you into the freezeout "an attendant has been notified to assist you" screen. Do not pass go, do not insert your $200. You will stand there twiddling your thumbs until the attendant "assists" you by verifying that you have indeed taken zero bags. Next time, I'm taking a bag. A nickel is a low price to pay to avoid waiting for this "assistance". Baggers are more likely to put beer and milk into your bags. This makes them much easier to carry into the house. Dear reader(s), what are your thoughts on the bag ban? Share them in the comments!